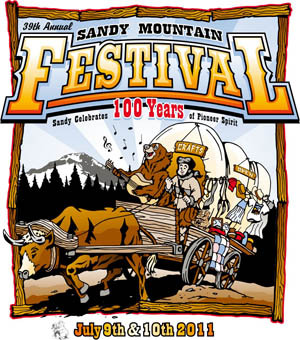 The 39th annual Sandy Mountain Festival in Sandy, Oregon celebrates the city’s 100th birthday this year. The nearly week-long party kicks off with the parade down Proctor Ave on Thursday, July 7 and continues through the weekend with live entertainment, over 150 artists and 20 food booths on display in Meinig Park, a carnival and events for kids. The best way to make sure you don’t miss any of the festivities is to stay in a Mt Hood Vacation Rental for the long weekend. Reserve one of our Featured Mt Hood Vacation Rentals, July 4-8 and receive an automatic 10% discount. Kids' Pet Show on Wednesday, July 6 at 10:30 am behind the Sandy Aquatic Center. Bring your pet and show off some tricks. Kids' Bike Derby on Thursday, July 7 at 10:30 am at the Cedar Ridge Middle School track. Categories for kids ages 3 and up. 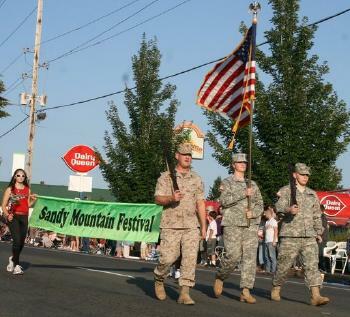 Sandy Mountain Festival Parade, Thursday, July 7 at 7:00 pm. Enjoy a true home town parade that features horses, antique cars, floats, marching groups and Sandy's five-generation court. Sandy Music, Fair and Feast in Sandy's Centennial Plaza. Thursday Night is Family Night, 6:00 -11:00 pm featuring Anything Goes Band (the band will not play during the parade). Free to attend. The Junior Talent Show is on Friday, July 8 from 2:00 to 4:00 pm (with cake and ice cream!). 6:00 pm to 12:30 am is entertainment for people 21 and over. Enjoy the beer and wine garden, margarita booth, concessions and main stage entertainment with live music from Dirt Farm Cowboys and Crush. Open Microphone Session is on Saturday, July 9 from 3:00 – 5:00 pm. Those 21 and over will enjoy live music featuring Lock, Stock & Barrel and Crush from 6:00 pm to 12:30 am in the beer garden with beer, wine and margaritas. Get your $2 off admission coupons from Sandy Les Schwab! Kids' Carnival and Events will open after the Parade on Thursday and continue through Sunday, July 7 - 10. 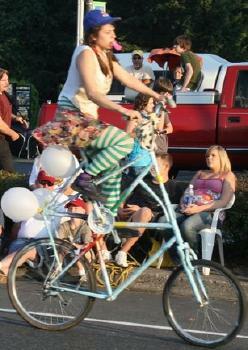 Other kids’ events include a pet show, bike derby, puppet shows and a kids’ parade. Birdcage Theater Performances throughout the day on Friday and Saturday, July 9 - 10. 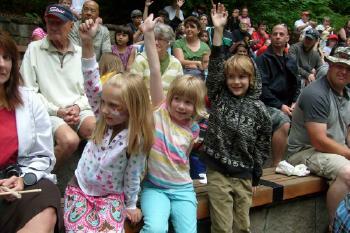 Enjoy Oregon Old Time Fiddlers, Penny’s Puppets, the Sandy High Jazz Quartet and more! Dale Nicholls Front Stage features live performances of music throughout the day on Friday and Saturday, July 9 - 10.